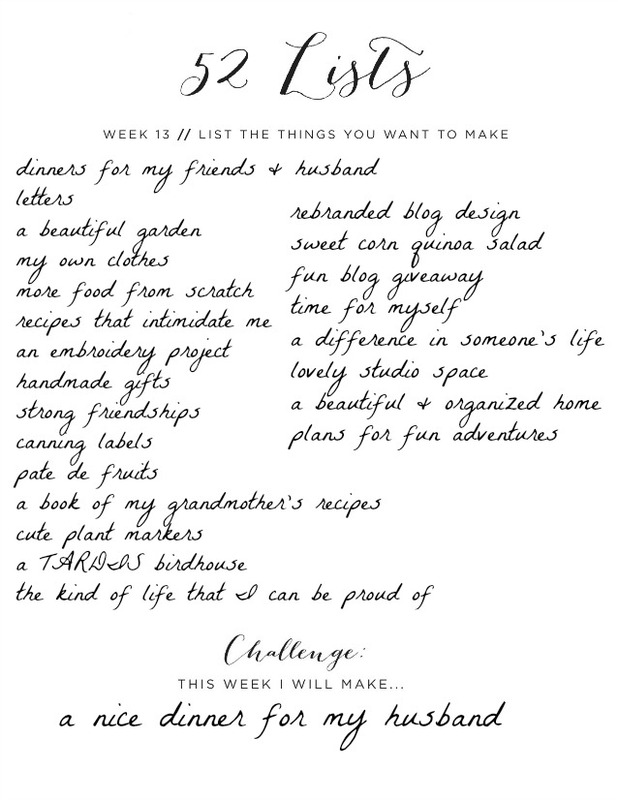 This week's list is all about creating. Ever since I was a little girl, my mother ignited a love of crafting in me. We used to go to the craft supply store every few weeks and she would let me pick out anything I wanted to make. And I have taken that love with me into adulthood. I am lucky enough to have a whole craft studio in my home to call my own. Sadly, lately I just haven't been crafting a whole lot. I think I have just been putting a lot of creative energy into other outlets and projects, but I know the love isn't gone...it's just the ebb and flow of things. This list was a nice reminder to connect with that creative part of myself again and really start figuring out new ways to use that room full of amazing supplies. It was also a nice reminder that those crafts make me feel amazing, but they are not the only things that I make or that make me feel creative. I am so lucky to have a life that is full of potential to make new things all of the time. What is on your list this week? What will you be making? I love the idea for a book of your Grandmother's recipes.